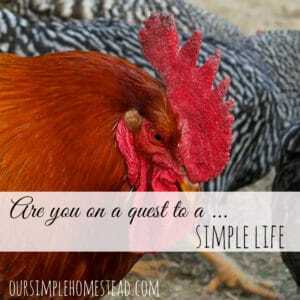 Do you have a dream self-sufficient living on a homestead? Do you live in the city or suburb and think you have to live in the country to homestead? I am here to show you that no matter where you live, self-sufficient homesteading can be in your future. 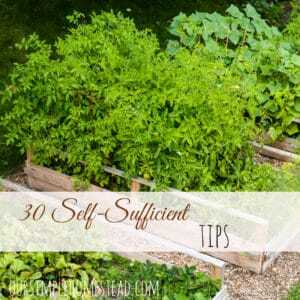 Let’s take a look at the term self-sufficient and homesteading. 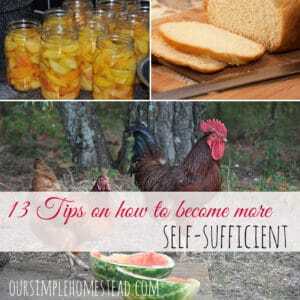 Self-sufficient means needing no outside help in satisfying one’s basic needs, especially about the production of food, and homesteading means living a lifestyle of self-sufficiency. 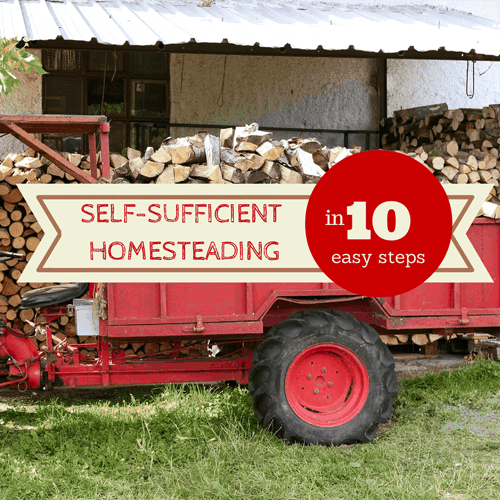 So by those definitions, the key to homesteading is learning to be self-sufficient. 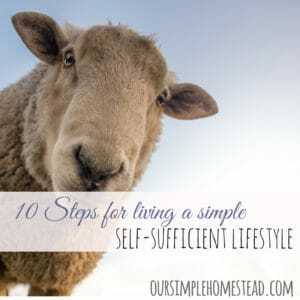 If you are looking for ways you can start being more self-sufficient here are ten very basic things you can do no matter where you live! Have a true appreciation for life and don’t listen to the naysayers. -We often get responses to our basic living lifestyle with raised eyebrows, but we find strength in knowing we can take care of ourselves through power outages, financial hardships, droughts and anything else the good Lord throws our way. Start growing your food. -If you live in the city, replace your lawn with a garden, plant fruit trees and learn to hunt and fish. There are state game lands in almost every state that welcome hunters if you do not have land of your own. Find a backup energy. -Find an alternative heat source. If you have a fireplace convert it to wood and store wood to be used through power outages or at least invest in a generator or propane heater. Find ways to be frugal. -One of the easiest ways to become more self-sufficient is to stop relying on always buying new. Reuse, recycle and do without is our motto!. Buying second-hand clothes, furniture, hand tools, and toys have saved us thousands of dollars over the years that we have put toward paying off our debt. Stop buying paper products. -Look at the money you waste each week on paper towels, tissues, and napkins. Those paper items can be replaced with old rags. Review your budget. -Look at your current budget and cut out anything that is not a necessity. If you have debt, this is the first place to look. Leave some wiggle room for special occasions, but do you need a $100 cable bill or $75 hair cut? Raise backyard farm animals. -Most cities are now allowing small animal permits within city limits. Rabbits and chickens are both great animals you can raise to feed your family even if you live in the city. Raise honey bees. – The honey you pull from the hives twice a year will provide endless amounts of all-natural healthy sweetener for your family. Save your seeds. -When planting your garden use heirloom seeds. You will only need to purchase the seeds once since you save the seeds from year to year. Learn the benefits of herbs for medicinal purposes. – Our forefathers did not have local drug stores to rely on, and most ailments were cured with herbs. Herbs are easy to grow, and their uses are endless. Living a simple self-sufficient lifestyle can happen wherever you are. Work on one step at a time, and before you know it, you will be taking care of most of your family’s basic needs, right from your own backyard! 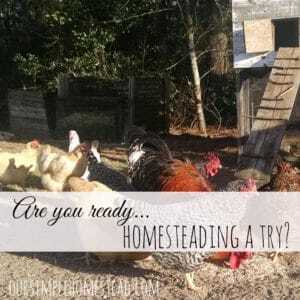 What things do you do that are homesteading friendly and are putting you on the path to being self-sufficient? Hi, beautiful site you have here and a great post! We’ve been growing a garden for years, and canning/freezing the harvests. Last fall we moved and, while we continued to grow a garden, the new property also has mature apple and pear trees. I’ll be learning to can those in a few weeks! Also, we got our first flock of chickens this spring. They haven’t begun laying yet, but we are anticipating lots of eggs (we have about 20 pullets). I look forward to browsing more of your site. You are going to have lots of eggs with 20 hens you will love having all those fresh eggs! Our apple trees are not producing enough to can yet but in a couple more years we should have fruit. Thanks for stopping by! That is a great list! I love this lifestyle! I’m accomplishing several of these steps so I do have one foot in the door. I don’t know about raising animals except for the dogs and cats! I grew herbs for the first time this year! They multiply big time. I’m currently very interested in solar lighting and decreasing energy usage and thus the expense of using energy! Stopping by from Thrifty Thursday. Thanks for visiting Shirley! If you can raise a dog or cat then you are good to go with rabbits and chickens! They both are very easy to raise. I love the thought of solar lighting and hubby and I have plans of doing solar panels within the next couple years. Thanks for stopping by Jane! I have never had beetroot…are they like our red beets here in the States? I Googled Red Beets and yes they are the same thing – like courgettes you call them zucchini I think and Aubergine – Egg Plant… I keep learning…. Thanks that is good to know! I am just now planting a second crop of beets that should be down before the holidays…just in time for roasting! I have always cut my hubby’s hair but have not been brave enough to let him cut mine. I get my daughter to do mine. This is great- when we originally purchased our small farm our kids were in their early teens and the goal was to teach them hands on self reliant skills before heading out on their own. It was a fantastic decision and so blessed to have had this time. Learning as a family is the best! I’m featuring this post tomorrow at Garden UP green on Tuesdays with a twist – hope you stop by to link up and share. Thanks for the feature Carole and I will be sure to stop by! Teaching kids how to take care of themselves with self reliant tools is one of the best things we can do for them as parents. Great tips for living! I guess I have not realize one could live a homestead country life in the city! 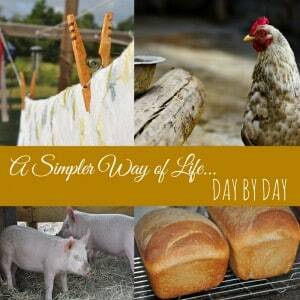 The greatest thing about homesteading is it is all in the way you think about living your life. You can slow down and get back to some basic living no matter where you live! Thanks for the feature Debra! I will be sure to stop by and check it out! 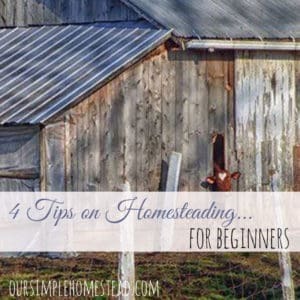 Homesteading is a mindset and it does not matter where you live as long as you are trying to get back to basics,learn how to take care of your self and try to replace some of the store bought items with homemade. Hi we raise our own garden, can most of our own food, raise rabbits, chickens for eggs, and sometimes meat (depends on how mean my rooster gets :/) have a fireplace but are planning to get a wood burner to help lower costs of propane…we raise pigs, cows, goats, have cats and dogs….I’ve planted herbs, which most go to our chickens… And love nature, interested in raising honey bees just haven’t pulled the trigger, we hunt almost every year for meat, and am trying to save seeds for the next years harvest…love being mostly self sufficient . Love to learn more on herbs and what they are good for other then cooking. Thanks for your great blog…have any info on local homesteaders? I wish I did have some information on some local homesteaders…what a great resource that would be! I just adore your blog! Praying that someday soon we can save up enough to buy an acreage in the country. We live on an acre just within city limits, and are in a “residential” zone, so we can’t have livestock. I don’t see anything about bees in the city code–so we’ll be introducing those this spring! also, that herbal site you link to is enough to kill someone who thinks those alternatives can actually help. for instance, ST Johns Wort is proven to have no effect on depression and if you will take that instead of actually getting help, you are putting your life at risk. Thank you so much for your comment. By no means am I a professional and these tips are only given as a guideline on ways to become more self-sufficient and as with everything are up to you on what you choose to apply to your life. number 10 is just an irresponsible suggestion. Our “forefathers” also had a life expectancy of 40. 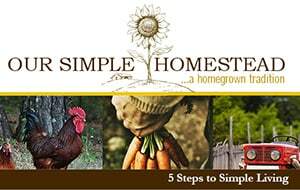 I love your website and the steps you list for homesteading. I am trying to improve my life but I do have trouble with item #10. Our forefathers had to rely on herbs for medicinal purposes because there was no modern medicine. They also died a whole younger than we do today. That may be because of advances in medicine or my favorite idiom: we have so many preservatives in our processed foods that we are being pickled. So true! We have so many preservatives in our processed foods that we are being pickled. Tracy – Some great tips here! Thanks for sharing. We started our bit of a homestead about 6 years ago, raising our own food and meat, and learning to be more self sufficient. While it is a lot of hard work, it has been very fulfilling. We are in the process of moving closer to family but hope to be settled on a new homestead in this next year. Enjoying your blog very much. I agree it is a lot of work, but so very rewarding! Thanks for stopping by! What a great post and I am almost there…need a back up energy source and some honey bees 🙂 Thanks for your incredibly helpful blog! 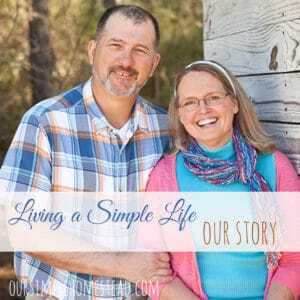 i want to live a self sufficient life, but my husband doesn’t. He wants all of the high tech stuff, buy everything new and name brand things. What do I do? Donna not everyone, including some husbands or wives have the same dreams and that is ok. Don’t let it get you down! Do things for yourself that are on the simpler side of things. Read a book instead of watching TV, learn to sew or make bread (I bet your hubby would even enjoy a loaf of homemade bread,) plant a small garden, but overall just find some things that help you feel like you are learning how to slow down and take care of yourself without relying on electronics and fancy appliances. Living simple is a state of mind and it is perfectly alright if your husband doesn’t share your desire. Dear Tracy. Wow love your post. My husband and I lived our first 44 years in the city. But our hearts and simple living was always in the country. While in city we did raise any garden we could fit in. We had fruit trees. And for awhile raised rabbits for meat. We always froze and canned any thing we could. Both worked and raised family. But was as frugal as we could be. Always using coupons and cooking by the weekly bargins. Bought second hand alot. Yard sales and thrifty stores. Big fan of dollar stores. Made do with what we had. Wore things out, did not chase style. Then almost 3 years ago we retired and moved near our kids and in the country. We are living our dream. We have 5 acres. Where we have a large garden, also a large berry garden. We have 12 chickens (which my husband gave me instead of flowers on valentine day) we have dogs and 2 ponies also given to us. We have one mature plum tree which we took care of and it is producing again. We have planted 8 new fruit trees. Bees not in our future I am allergic to them. We make less and less trips to town. With a motto use what you have. We cook all our meals. Big big savings. We repair clothes. Love to fish. We have wood stove and propane as heat sorts. We are living our dream. But it is truly hard work. We keep our place picture perfect at all times. Alot of mowing. But we love it and would not trade country living. God has truly blessed us in allowing us to live here. We are Christians and believe in giving both to God and others. That to is a blessing to be able too. Love your blog. Faye I love your story! Thanks so much for sharing it with us. Love this post! I Am a homesteader at heart and find that to be content the best kind of wealth! Thanks for sharing! Dear Tracy; Love your inspiration! I have a proposal from our farm to yours. Will you please contact me.